And here's a semi-delightful film which serves comfort food to film buffs. A remake of Jon Favreau's film by the same name, this film is more of a kitchen disaster than a chef's signature dish. Unappetising! Well, though, Chef is predictable in parts, the journey is an enjoyable one. Choose what you wish to eat while watching it. Popcorn or some of that delicious pasta which Roshan K whips up in a jiffy. Raja Menon’s overstuffed but enjoyable remake of the Hollywood movie has likeable characters and warm performances. 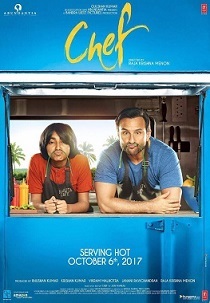 Saif Ali Khan’s Chef offers moments of brilliance which, if weaved in a more organised manner, may have given us a light, affable film. But a lazy and rather uninterested narrative takes away the pleasure. In the nutshell, Raja Krishna Menon's ‘Chef’ demands some more tadka. Overall, Chef is a feel-good film about the importance of relationships and the message comes across smoothly albeit garbed in a long-drawn plot. Their son, Armaan (master Svar Kamble), lives with Radha.